To those who diagnose me as being insane, crazy, mad and similar I beg to consider the following. My planned non-stop circumnavigation in a ten feet boat is a world record attempt. There are not many branches of sport were a man 73 years old and with a pension of 500 € can successfully compete. Are persons who challenge crazy? Every year many persons try to climb Mount Everest. Smart persons realize that it is much easier, cheaper, and safer to climb a lower mountain. People also play golf. They try to get a small ball into a distant tiny hole with the help of a club. A smarter person would move closer and use a bigger hole. I hope these examples illustrate my point and the point is that it has to be difficult, like Kennedy said, we will put a man on the moon, not because it easy but because it is difficult. Of course a boat twice as long as mine with the same weight will make a better sailer. But my intelligence is good enough to make me realize that if I used a boat twice as long I would have no chance of getting the world record of sailing around the world in the smallest boat. A boat, a few feet longer, but not more, would definitely be safer, so would driving a custom tank to work be safer than travelling in a small Japanese car but it would be overkill and most people consider a small car sufficiently safe. A ten feet boat is definitely sufficiently safe to sail south of the capes, not every ten feet boat, but if designed and built and sailed by me. Such a ten feet boat is definitely safer than a 40 feet production boat. Big boats are complicated. They attract big forces. A capsize in one of them is very dangerous. Hurricanes? He asked surprised. He had thought that the wind was a bit strong but he had not realized that that he passed through four hurricanes. Big boats would not have survived so easily. I have spent 50 years with mostly small boats, plus 15 years living on the windward side of a small island in the North Sea. Our house was not many meters from the sea. During my fifty years with small boats I spent two six months periods cruising the southern high latitudes in boats 19 and 20 feet long, mostly during the winter. Many of the persons who criticize me haven’t even sailed these waters themselves, some may have, but my guess is that that was in big boats. And big boats are dangerous and uncomfortable and difficult to handle in heavy weather. Big boats are not only dangerous they waste our planets limited, non renewable resources. Growth is coming to an end. Peak oil has already passed. Limited resources cannot sustain unlimited growth. We better face up to the new coming reality of austerity. 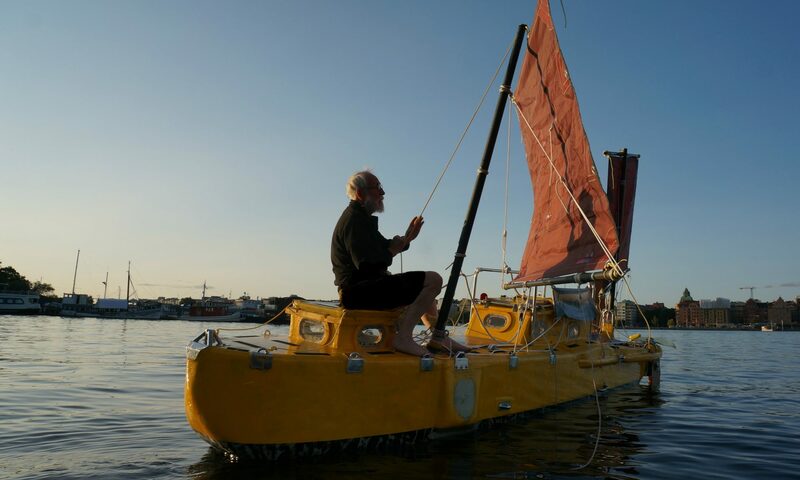 By living at sea for one year, non stop, in a ten foot boat I hope to be able to contribute to the necessarily needed new technology which has to emerge if we as civilized humans hope to survive for a few more generations.